Watch the children bounce with there favorite Looney Tunes cartoon character from Sylvester & Tweedy, Daffy Duck and Bugs Bunny to name a few. This bouncer is 15� wide by 25 long and 16� tall and a hit with all ages. This unit features a spring-loaded safety door to keep the children safe while bouncing in the clubhouse. This bouncer is 15� wide by 25 long and 16� tall and a hit with all ages. This unit features a spring-loaded safety door to keep the children safe while bouncing in the clubhouse. 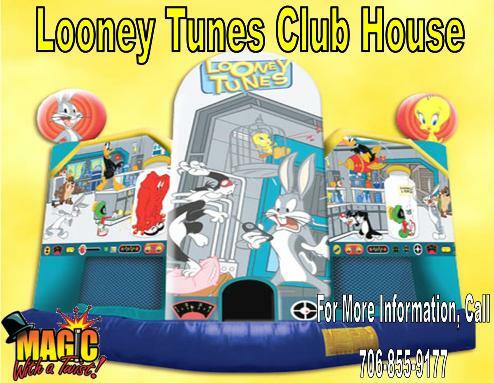 The Looney Tunes Club requires a relatively flat area about 18� x 28� and within 100' of an electrical outlet. This unit has a weight limit of 150 pounds per child. We prefer to set the inflatable up on grass but some concrete or asphalt maybe acceptable as well. Please make sure all sticks, rocks and dog waste are cleared from the area before we arrive, to avoid delay in setting up for your event. © 2019 Magic With A Twist. All rights reserved.